Home Editorial Whose Dictator Is Gaddafi? AFRICANGLOBE – To put the West’s case bluntly and simply, it has apparently intervened in Libya to ‘protect the people’ from the ‘dictator’ Gaddafi. This begs the question: whose dictator is Gaddafi? To understand this apparent contradiction, one needs to appreciate the vital difference between a colony and neo-colony. A neo-colony is ruled by the Empire not directly; only indirectly – through its agents in the countries concerned. Whilst a neo-colonial economy, and hence the neo-colonial state, is, in the ultimate analysis, controlled by the Empire – on behalf of global finance capital. There is a ‘government’ that is in the seat of governance, and this government, or regime, is often in open defiance of the Empire. When the Empire talks of ‘regime change’, it means change in government without losing its control over the neo-colony. Notwithstanding all this, and despite Gaddafi being a thorn in the flesh of the Empire, Libya (like Zimbabwe) has remained a neo-colony of the Empire. A few facts attest to this reality. Libya is OPEC’s 8th largest oil producer. It depends primarily upon revenues from the petroleum sector, which contributes practically all export earnings and over half of GDP. According to the International Energy Agency, more than 70 per cent of its oil is exported to European countries, especially Italy, France, Germany, and Spain, many of whom have invested heavily in Libyan oil. For example, by the end of October 2010, the number of French companies in Libya had nearly doubled from 2008 – most of them in the energy sector. It is no wonder that President Sarkozy is so nervous about the outcome of the current civil war in Libya. Italy alone buys a quarter of Libya’s oil and 15 per cent of its natural gas. In all these years, Italian companies continued to retain a strong presence in Libya, which owned significant shares in Italy’s Eni oil corporation, Fiat, Unicredit bank and Finmeccanica. In January 2002, Gaddafi purchased a 7.5 per cent share of Italian football club Juventus for US$ 21 million, through a long-standing association with Italian industrialist Gianni Agnelli. As well as Italy, several other European and British companies maintained strong commercial interests in Libya. This is at the national level. But at the personal level, the Gaddafi family became extremely wealthy as a result of his continuing links with the Empire. The $70 billion Libyan Investment Authority (LIA) is a state institution, but it would be a safe bet that Gaddafi has (or had, until a recent freeze on it) full control over it. Whilst he financed many groups fighting the Empire, he and his sons, known to live in opulent luxury in the West, often donated money to ‘liberal’ causes, such as the London School of Economics Centre for the ‘Study of Global Governance’; indeed, the former Director of the LSE, Anthony Giddens, (Prime Minister Tony Blair’s political mentor) visited Gaddafi in 2007 to give him some lectures on ‘democracy’. However, Gaddafi has his idiosyncrasies. He is trusted neither by the Empire nor by his fellow heads of state in the Arab League and the African Union. President Museveni, in praising Gaddafi as a ‘nationalist’ criticised him for his ‘mistakes’ – among them, backing Idi Amin in Uganda; pushing for a United States of Africa; proclaiming himself ‘king of kings’; ignoring the plight of Southern Sudan; and promoting terrorism. For the Empire, Gaddafi had become an unreliable, indeed dangerous, neo-colonial dictator. The Empire had to bring him to book. Here is a brief account of how the Empire ‘disciplined’ Gaddafi and finally succeeded. For most of the 1980s and 90s, Libya was under the Empire’s economic and diplomatic sanctions. In April 1986, a joint US Air Force, Navy and Marine Corps force attacked Libya. In 1993 the UN imposed sanctions against it. As the sanctions began to bite, President Nelson Mandela made a media-hyped visit to Gaddafi in 1997 followed by the UN Secretary-General Kofi Annan. As a result of these overtures, Gaddafi agreed in 1999 to hand over two Libyans accused of planting a bomb on Pan Am Flight 103, which came down on Lockerbie, Scotland. Gaddafi paid compensation to victims of Lockerbie – US$2.7 billion to the families of the 270 victims, i.e. up to US$10 million each. The UN sanctions were thereupon suspended, but US sanctions against Libya remained in force. Gaddafi went on to cooperate with investigations into previous Libyan acts of state-sponsored terrorism, and agreed to end his nuclear weapons program. On 15 May 2006, the US State Department announced that it would restore full diplomatic relations with Libya, and that it would be removed from the list of nations supporting terrorism. Libya was thus restored to its ancien regime status as a neo-colony. Following Gaddafi’s rehabilitation, several imperial Heads of State, most flamboyantly the British Prime Minister Tony Blair, French President Sarkozy and Italian Prime Minister Silvio Berlusconi rushed to Tripoli to shower the ‘dictator’ with photo opportunities of kisses and hugs and to secure from him investment opportunities as well as access to oil. In March 2004, Blair went to Libya, and praised Gaddafi for his co-operation. In July 2007, Sarkozy visited Libya and signed a number of bilateral and multilateral (European Union) agreements. In August 2008, Berlusconi signed a landmark cooperation treaty in Benghazi, under which Italy agreed to pay $5 billion to Libya as compensation for its former military occupation, in exchange for Libya agreeing to stop illegal immigration to Italy, and investments in Italian companies. As the diplomatic editor of The Daily Telegraph, David Blair, said, Libya’s ‘Brother Leader’, had gone from being ‘the epitome of revolutionary chic’ to ‘an eccentric statesman with entirely benign relations with the West’. (The Daily Telegraph, 13 August 2009). Britain’s Prime Minister Cameron, not to miss his turn, went to Libya to sell arms to the Empire’s neo-colonial dictator, even as the people were marching against him in Tripoli. But how to get rid of Gaddafi became a bigger problem for the Empire than getting rid of Ben Ali and Mubarak. Earlier, I explained two vital differences between a colony and neo-colony. There is a third difference between the two. Unlike colonies, neo-colonies are ‘sovereign’ states, and members of the UN. They have rights as ‘independent nations’, rights to self-determination, and rights to development. The Empire cannot just bomb a sovereign member of the UN, for example, without the UN’s sanction, especially of its Security Council, which is the organ in the UN that deals with matters of international peace and security. This creates hurdles for the Empire. In the UN context, for example, the Empire has to get Russia and China (the two other permanent members of the Security Council with a veto power) on board, and at least a majority of the remaining non-permanent members before it can attack a neo-colony. The Empire could not just attack Libya and take out Gaddafi. A proper rationale had to be engineered – one that could be sold to the Empire’s own sceptical publics, to ‘allies’ in the other neo-colonies, and to allies in non-imperial Europe and the rest of the third world. The critical support needed here was that of the other neo-colonies in the Arab World, best of all if it could be expressed institutionally by the Arab League. After much neo-colonial ‘persuasion’ and carrot dangling, this was achieved. For years the League has been belittled, even ridiculed, by the Empire for its flabbiness and foibles. Suddenly, when the League supported the ‘no-fly zone’ against Libya, it became ‘the voice of the Arab people’. In the event, Russia and China abstained, as also did India and Brazil, for reasons that we cannot go into here. For good measure, the African neo-colonies – South Africa, Nigeria and Gabon – voted in favour of the resolution. Once these ‘enabling conditions’ of a new ‘diplomatic reality’ was created, the Empire was quickly able to get the Security Council to pass a ‘consensus’ resolution. 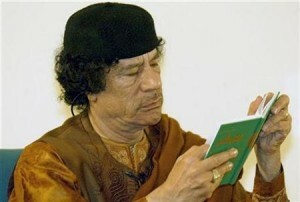 Resolution 1973 (2011) demanded ‘an immediate ceasefire in Libya, including an end to the current attacks against civilians’, which it said might constitute ‘crimes against humanity’; it imposed a ban on all flights in the country’s airspace – ‘a no-fly zone’; and tightened sanctions on the Gaddafi regime and its supporters. It authorised Member States, ‘acting nationally or through regional organisations or arrangements, to take all necessary measures to protect civilians under threat of attack in the country, including Benghazi, while excluding a foreign occupation force of any form on any part of Libyan territory’ – requesting them to immediately inform the Secretary-General of such measures. Libya is a neo-colonial state; it is imperial finance capital which, despite contradictions, is in effective control of the state and its economy. Gaddafi has been an unwilling neo-colonial dictator for finance capital, with a rather utopian vision to liberate from the Empire; utopian because he wanted to fight the Empire whilst still keeping the country’s and his own wealth within the imperial industrial, financial and banking system. The Empire might have accommodated him, and indeed did rehabilitate him after his turnaround in 1999, but the ‘Arab Spring’ upset the programme of the Empire, and it had to quickly take a U-turn and ditch Gaddafi just as it Ben Ali and Mubarak. The issue of how things might move forward in Libya is a big issue, one which we shall write about in the next column. Previous articleHow do you solve a problem like Sarkozy?